Cape Town - The Crusaders secured a 12th Super Rugby final appearance after they beat the Chiefs 27-13 in a clinical performance in Christchurch. Despite scoring four tries - through Bryn Hall, Israel Dagg and Seta Tamanivalu (2) - it was the hosts' defence that starred as they again frustrated a team. They now wait to see whether they will be facing the Lions in Johannesburg or hosting the Hurricanes in Christchurch. The Chiefs, meanwhile, can hold their heads high as against many other teams they would have won this game, with the Dave Rennie era coming to an end. Tawera Kerr-Barlow, Aaron Cruden, James Lowe, Hika Elliot and Stephen Donald will also leave the franchise following this loss. Travelling back from Cape Town didn't affect the Chiefs early on as they enjoyed the majority of possession. In fact they had 70 percent of the ball in the first half and were hugely unlucky not to be leading, with the Crusaders' stingy defence helping keep their noses in front. The Crusaders didn't have any ball in the opening 10 minutes but strong tackling and organisation kept the Chiefs out before Richie Mo'unga kicked over three points on 14 minutes, this after James Lowe had rushed up offside to stop an attack. The wing was lucky not to be yellow carded. Those points lifted the home side and they made it 10-0 four minutes later when a slick attack down the left channel near halfway saw Matt Todd, Ryan Crotty and Dagg combine before the wing put the ball inside for scrumhalf Hall for the run-in. Mo'unga added the extras. Soon after though the Chiefs seemed hard done by when Lowe's nice grubber through saw Tim Nanai-Williams dive on it over the whitewash. But the TMO felt the wing lost the ball while attempting to ground the ball so the try was chalked off in a controversial call in Christchurch. Fortunately for the Chiefs they did get points on the board in the 26th minute when McKenzie punished the Crusaders for coming offside and following another spell of sustained pressure in the hosts' 22, the fullback struck again to make it 10-6 at the end of a thrilling half. The Crusaders showed their clinical edge yet again eight minutes into the second period as a loose ball was hacked into the Chiefs 22 before Cruden's poor pass led to Lowe being tackled by Mo'unga in the attempt of clearing his lines. Dagg duly collected the ball to make it 15-6. And that flicked a switch in the Crusaders' camp with Tamanivalu scoring at the second time of asking after he was held up well by Tawera Kerr-Barlow. Seconds later from the scrum set-piece the big wing crashed over before Mo'unga converted to push his side 22-6 to the good. 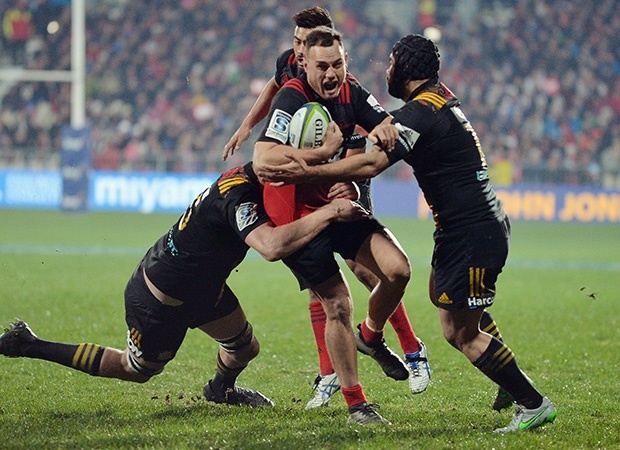 The Chiefs now had a mountain to climb while the Crusaders were looking to wrap up the win via a try, not penalties. Eventually they got what they were after as former Chief Tamanivalu crossed on the right touchline to add the icing to a ruthless performance from his side. But credit the Chiefs who finally crossed the whitewash through Brodie Retallick after a slick break from Anton Lienert-Brown, which was hugely deserved as the Hamilton outfit had the final say on a game that will be remembered for that incredible Crusaders defensive effort.